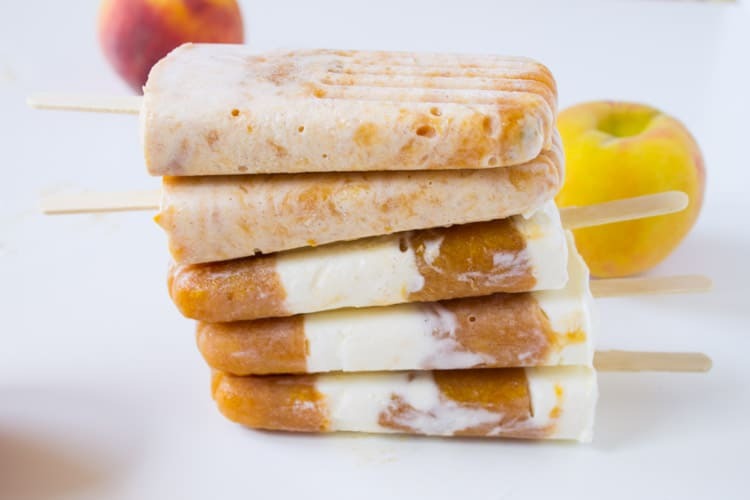 Perfect for a summertime treat, these roasted peaches and cream popsicles are made with Greek yogurt and fresh roasted peaches! Popsicle molds are a life changer. 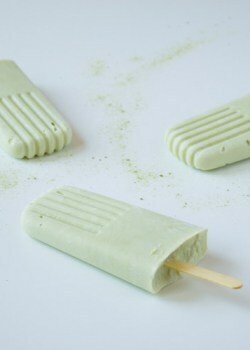 I must be a little late to the summertime treats party because I just got my first set of popsicle molds this year. And as soon as I used them, I had one of those “a-ha” moments like where has this genius tool been all my life? I suddenly realized that all of my summers prior to this year had been so deprived. Deprived of homemade popsicles, that is. 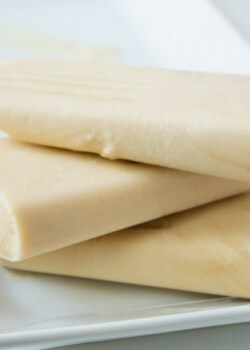 No kid, or adult, for that matter should go a summer season without some homemade frozen treats. If there was a book of foodie commandments, I’m pretty sure that one would be in the top 10. Why the passion for the popsicle? It’s a super easy, healthy, and refreshing dessert for the hot summer months. 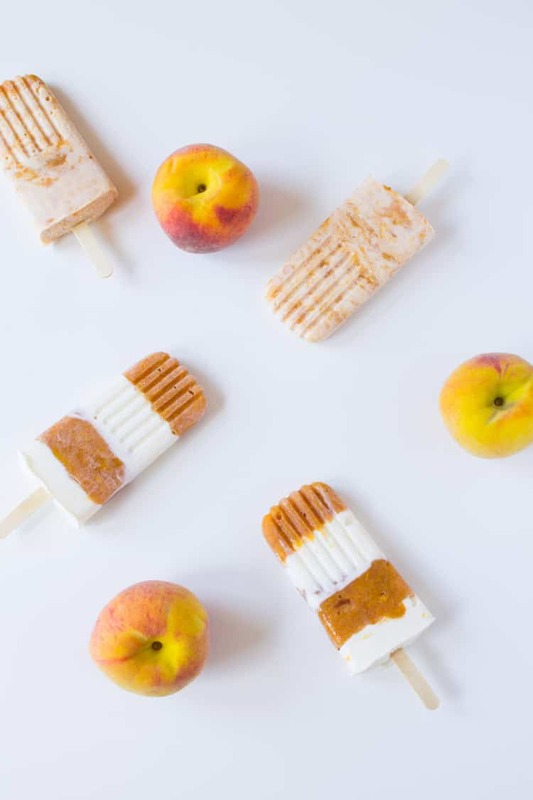 Trust me, you need these homemade Roasted Peaches and Cream Pops in your life! For the full recipe head on over to Food Network’s Healthy Eats Blog! Thanks, Sonali! Roasted fruit is gold, IMO. I do love peaches, especially when they are juicy. Very refreshing fruit. 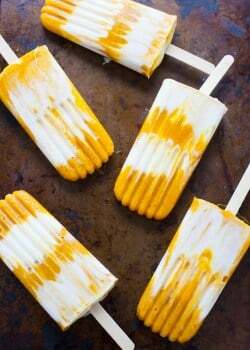 I have never been one to have my own popsicle molds but I think I might purchase them because I have seen 2 recipes now including yours to make popsicles and the temp is rising so I need something to cool me down. I have read the recipe is cinnamon necessary? Not really a fan of it or can you hardly taste it? Hey Adam – purchasing popsicle molds was one of the best decisions I’ve ever made :). The cinnamon is not really necessary if you’re not a fan – there’s a subtle hint of the spiced taste in this recipe. Yum! I’ll have to make these to preserve all our SC peaches! Yes!! Let me know how it turns out! I have a bunch of beautiful ripe peaches in my kitchen right now! Perfect! Sounds like they are just waiting to be put in a popsicle mold! Uh, these seriously made my stomach growl this morning! You’ve convinced me to get some popsicle molds. Hoping to come up with some bariatric options for my WWC patients. So many options!!!! Doooooo it! You won’t regret it. I can’t wait to look at this recipe!!! I thought peaches and cream was delicious, but roasted peaches and cream sounds like pure heaven! Thanks for sharing! Thanks so much, Rachel! Enjoy!